German Gomez, Condenado XVIII (The Damned XVIII), 2008, C-Print on Paper and Thread on Forex, 35 3/4 x 21 3/4"
Important post-war works by Jackson Pollock and David Hockney alongside work by contemporary artists from the Gallery’s roster will be on exhibit during the fair. The Gallery is especially proud to present Jackson Pollock’s oil, ¬¬¬¬Grey Center. Painted in 1946, the painting demonstrates Pollock’s innovative melding of the Surrealist idiom with Cubist space. Immediately preceding his breakthrough drip paintings, Grey Center is an important milestone in Pollock’s career, showing his all-over technique and vigorous brushwork, as well as his willingness to experiment. Another highlight of the Gallery’s stand is David Hockney’s oil Three Sunflowers and a Bottle of Water from 1996. A recent spate of Hockney shows in Europe and the United States have reminded the art world about his immense influence and talent. Three Sunflowers references several canonical art historical sources, such as Matisse and Van Gogh, and the inclusion of a bottle of French water is a tongue in cheek nod towards the School of Paris. Lighthearted yet without irony, the work epitomizes Hockney’s contributions to contemporary painting. Three Sunflowers will be complemented by Hockney’s well-known suite The Weather Series. This set of six lithographs, executed in southern California and published by Gemini in 1973, are influenced by the stylization of weather in classic Japanese woodcuts. As with Three Sunflowers, Hockney is shown in these works to be both playful and masterful, combining an unerring ability to draw with his deep understanding of art history. The Gallery is especially pleased to offer the complete set for sale. Bridgette Mayer will also exhibit works from her own roster of artists. Steve Tobin will again have a major presence in the Gallery’s stand, as well as outside the entrance to the fair. Tobin’s monumental, nature-based works in bronze and steel have been exhibited at Grounds for Sculpture in Trenton, New Jersey; the Frost Art Museum in Miami; the City of Osaka in Japan; the Torode Group of Companies in Calgary, Canada; Laumeier Sculpture Park in St. Louis, Missouri, among many other sites in the U.S. and abroad. Tobin currently has a major show of 14 Steelroots on view at the Morton Arboretum outside of Chicago. Tobin is perhaps best known for the Trinity Root, the first and only 9/11 memorial near Ground Zero in Lower Manhattan. Tobin has been selected by Art Miami’s curatorial team to exhibit two large bronze sculptures at the entrance of the fair welcoming all visitors. Also for sale will be new pieces from his Steelroots series and a large work in clay and glass from his Exploded Earth series. Meticulous craftsmanship and a deep response to nature lie at the heart of these works. Along with Steve Tobin, Gallery artist Paul Oberst was also selected by curator Julia Draganovic to have a large-scale aluminum sculpture, titled Banded Props, on view for Art Miami visitors. The Gallery will also feature recent photographs by Oberst in collaboration with photographer Patrick McNamara. These Banded Boys are inspired by Oberst's appreciation for banded trickster performers the world over, especially in the American Southwest. Bridgette Mayer will also be introducing three artists who have recently joined the Gallery: German Gomez, Angel Ricardo Rios and Federico Herrero. Spanish artist German Gomez will exhibit selected works from his 2008 series of photo-based nudes, The Damned. 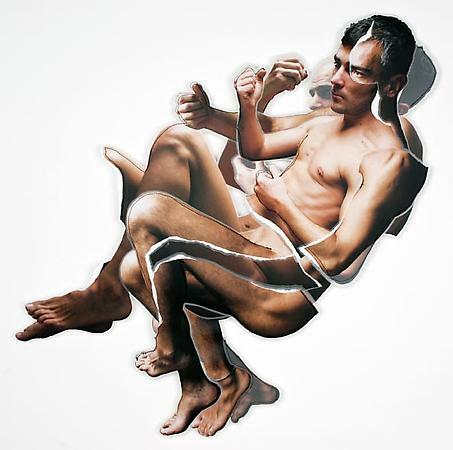 Inspired in part by Michelangelo’s Sistine Chapel, Gomez's figures, fragmented and contorted, are modernized through the photographic medium and are at once isolated yet universal. Cuban-born Angel Ricardo Rios will show colorful abstract paintings that serve as the basis for his inflatable sculptures. Rios has had over 30 solo shows of his work throughout the world. Lastly, Federico Herrero, a young Costa Rican artist, will show two abstract works that continue his exploration of the tension between geometry and abstraction. Herrero is a recipient of the Venice Biennale's Golden Lion Award for best young artist. About Art Miami: In its 21st year, Art Miami is known as Miami’s premiere anchor fair. Distinguished for its depth, diversity and quality, Art Miami showcases the best in modern and contemporary art from 100 international art galleries and prominent art institutions.